When you become member you join a vital team some 18,000 strong that is helping to preserve New Jersey's wildlife and at-risk natural habitats. Your membership provides the essential financial support we need to maintain our wildlife sanctuaries and conduct critically important programs in Conservation, Advocacy, Research and Environmental Education. Join today and receive a special thank you premium: New Jersey Audubon's Guide to Some Familiar Birds of New Jersey is ideal for birders of all levels. 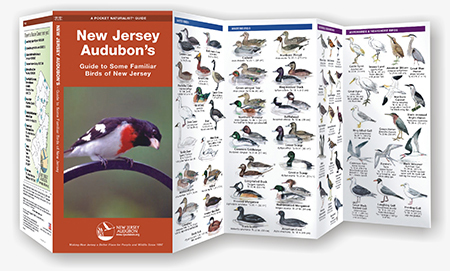 This handy pocket-sized, folding guide highlights more than 140 familiar bird species of the Garden State.